What is the first thing that comes to mind when you hear the word “Ball”? For me it’s Cinderella and her Glass Slipper (though in the version from my childhood it was a Crystal Shoe, which sounded even more romantic), the first ball of Natasha Rostova from War and Peace and a strange game we would play as kids. Lady of the Manor has sent you some money. With all that in the background, could I not be predisposed to like Grand Bal from Dior’s La Collection Privée? Grand Bal by Dior – created in 2012 by Francois Demachy, notes include bergamot, orange blossom, jasmine, ylang-ylang, musk and sandalwood. I really-really-really wanted to try it. I contacted a friendly SA from a Dior’s boutique and he was kind enough to send me some samples of Grand Bal. The first attempt wasn’t successful: the package had arrived with two completely smashed vials. Rusty had inspected the content of the envelope and found it interesting for playing with (I didn’t allow him to proceed with that) but useable only as a room freshener (I kept it for a couple of days in that role). Will I go to the ball for a bottle? Yes No I don’t know yet. I will try wearing the remaining portion of my Grand Bal sample “for real” (sprayed multiple times and not only on my wrist) and then decide. This entry was posted in "Four legs good", Attempt at a Review and tagged Dior, Grand Bal, jasmine, Jasmine Rouge, La Collection Privee, Tom Ford. Bookmark the permalink. Please try and write one of your wonderfully convincing reviews! OMG! We are linked Undina. I have Dior’s Grand Bal going up tonight too. If i wasn’t off to work soon I would do something else but we do quite different looks at the same scent. I should say that at least in one aspect we agree: it doesn’t stay on my skin longer than for 3-4 hours. But, in general, I’m fine with that in my perfumes – it allows me to wear more than one scent during the day if I don’t want to re-apply the same perfume, which I don’t mind doing either. Oooh thanks for this preview Undina. I’m very excited about Grand Bal but we’re not getting in London until September which seems crazy. They should have released Grand Bal now for summer and Oud Ispahan in September. I want to go to the Ball NOW! Anyway, you make it sound sound very appealing being low on the indoles and paired with orange blossom. It’s really strange that we got it here before you did – it happens… almost never. It’s a pity I have just a ml left in my sample and cannot send you some. Did you like By Kilian’s Love & Tears? These aren’t identical and develop differently but, to my nose, they are very similar on the initial stage in the mood – clear and innocent. I smelled this in Paris on a scent strip and quite agree with your assessment, Undina. An elegant jasmine that’s just that … elegant and refined, not dirty or sensual. Don’t know if I would change my mind if I smelled it on skin, but from what I remember of it, your choice of Waltz of the Flowers fits it to a T.
Thank you, Suzanne! You know how it happens: you connect something in your head with a music piece, a painting, a scent or a scene from a book and from this point on they stay tied together whenever you think of it. 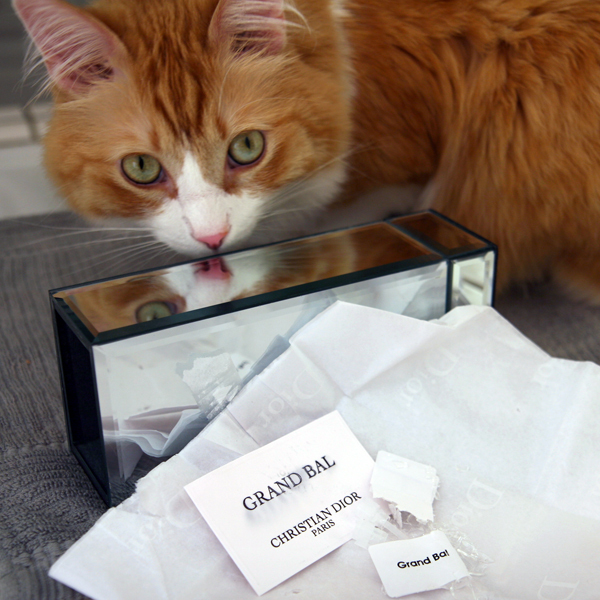 As somebody who got to enjoy Grand Bal on paper for several days ;) I should say that it is better on skin. Not dramatically but better. You have piqued my interest, as this was not even on my radar. I look forward to trying it when I have the chance. I will be interested to know what you think. Too bad it’s so difficult to come across this line anywhere in B&M stores. I do not think it’s good enough to warrant paying for trying (but if you like the perfume, I think it’s a very good ppml/quality ratio). I would definitely like for these to be in wider distribution. I think Dior could do very well with them in lots of markets, because as you say the overall value is good. I have been searching for The Jasmine for a while now, so tried Grand Bal in hopes it would be the one to get the glass slipper. Not sure of its slipper-worthy status yet; I liked it but didn’t love it, but the weather’s been very warm and I don’t think hot weather is Grand Bal’s forte. Thanks for your thoughts on this – now I’ll smile when I try it again! What do you think of Love&Tears? It’s the first By Kilian that I thought of getting into my collection based on how much I liked jasmine in it. Also, while testing Grand Bal, I revisited Yves Rocher’s Tendre Jasmin: for the price it’s very good once I got through the initial slightly more chamical than I’d like phase.